2016-06-09 09:34:12 -0500 asked a question How to delete Fedora Update System comment? 2016-05-05 12:49:00 -0500 commented question not able to play any video players in fedora 23 ??? What formats are you trying to play, and have you tried gstreamer-plugins-bad* or gstreamer-plugins-ugly*.from RPMFusion? For slightly more relevant help you can try https://unix.stackexchange.com/ , as Fedora is similar to centos but runs much newer packages anyway (e.g. PHP version 5.6.15), and also now uses DNF instead of yum. CentOS etc have older packages that are known to be stable, so aren't always up to date because of that. Wherever you decide to leave your question, could please you list the installed PHP packages (using sudo yum list php at a guess), and try and find where you installed them from (it should show up vaguely in the yum list, otherwise check the repos in /etc/yum.repos.d. Have you tried SELinux troubleshooter? You could get it ignore the errors, or let them through (bad idea). However, it would be best to notify the Chrome developers that there is a problem (the problem is more likely due to Chrome not Fedora). Alternatively you can use Chromium, which has nearly all the features of Chrome and is packaged by fedora developers so should work better with Fedora (e.g. https://copr.fedoraproject.org/coprs/... ) - the only thing is if you want Chrome's proprietary plugins you will have to add them manually from the Chrome RPM. lspci -nnk | grep -iA 4 '^[^[:space:]]. *net',lsusb & rfkill list all? CMAKE_CXX... needs gcc-c++ installed. I just ran into the same issue and sudo yum -y install gcc-c++ fixes it. 2014-07-24 07:18:59 -0500 commented answer How to get .mp3 decoder plugin for K3B on Fedora 19? 2013-12-11 11:10:13 -0500 commented answer password need bypassing. I'm stuck. 2013-12-09 06:44:10 -0500 commented answer password need bypassing. I'm stuck. 2013-12-04 16:30:34 -0500 answered a question password need bypassing. I'm stuck. 2013-12-03 15:05:00 -0500 answered a question Creating a Fedora remix with livecd-creator, no custom plymouth theme on live boot. 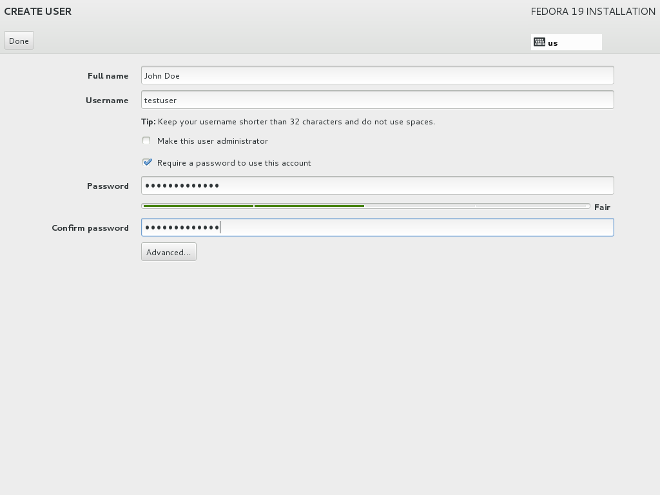 You should of setup the usename and password you need when you reached a screen like this when you installed Fedora. Perhaps you could do a fresh install of Fedora over the old one? 2013-12-03 13:56:12 -0500 commented answer How do I disable the GNOME Lock Screen?